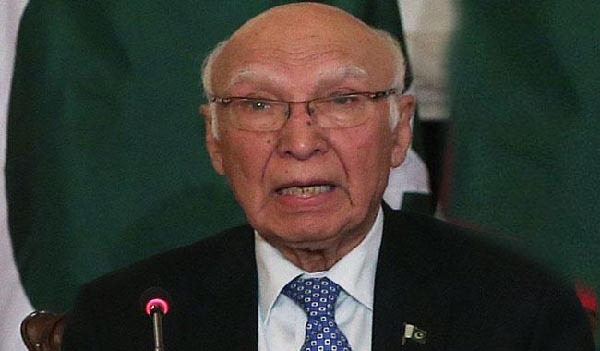 AMRITSAR, Dec 4 (APP): The Indian government on Sunday did not allow Adviser to the Prime Minister on Foreign Affairs Sartaj Aziz to hold a scheduled press conference on the sidelines of Heart of Asia Conference, citing “security reasons”. In sheer violation of diplomatic norms, the Adviser was stopped to leave the hotel, neither media persons were allowed to enter the premises to meet him. Also, the Indian authorities stopped Pakistan’s High Commissioner to India Abdul Basit to enter the Media Centre set up at the Conference venue. Arguments took place between High Commissioner Basit and security officials on his interaction with the Pakistani media persons. Sartaj Aziz will hold an urgent press conference tonight (Sunday) at 8:30 pm soon after his return from Amritsar.